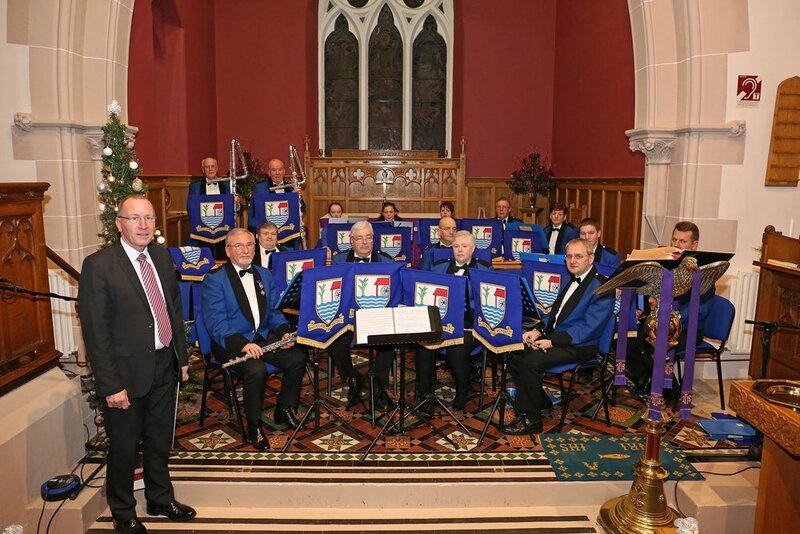 The build-up to Christmas Day continued this evening as, in keeping with a very long standing tradition, Ballyclare Victoria Flute Band led the praise at St Bride's annual Carol service. The congregation enjoyed the reading of the Nine Lessons interleaved with the singing of many well known Carols and the band played a selection of other Christmas music, including 'O Holy Night'. Thanks must go to the Ladies' Group for providing the seasonal refreshments in the church hall at the end of the service. 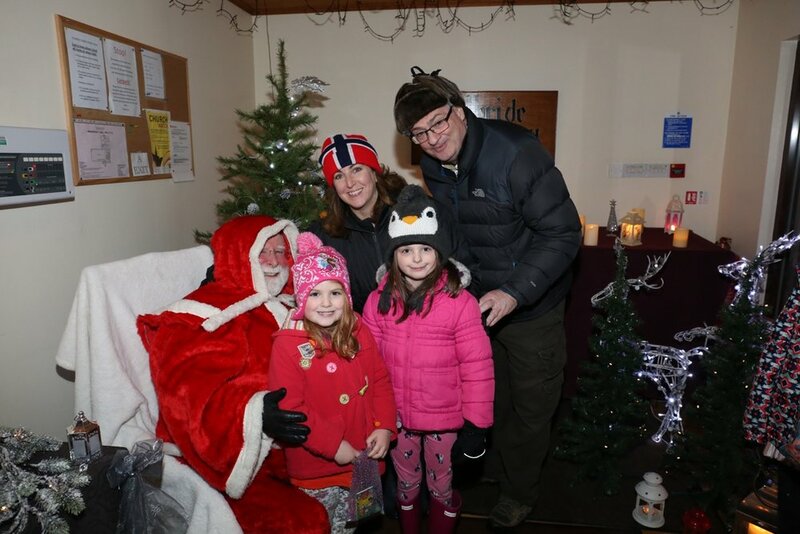 This evening a large crowd gathered outside the church hall waiting for the Christmas tree lights to be switched on. 1st Old Boys Silver Band provided the music and there was a buzz of excitement amongst young and old alike as the switch-on time approached. Immediately following the singing of a Christmas Carol and prayers the count-down began and the button was pressed illuminating the tree. Minutes later a strange sound was heard as a large tractor drove in through the front gates and parked near the front door. The children were delighted as none other than Santa Clause stepped down from the tractor with a bag of presents over his shoulder. 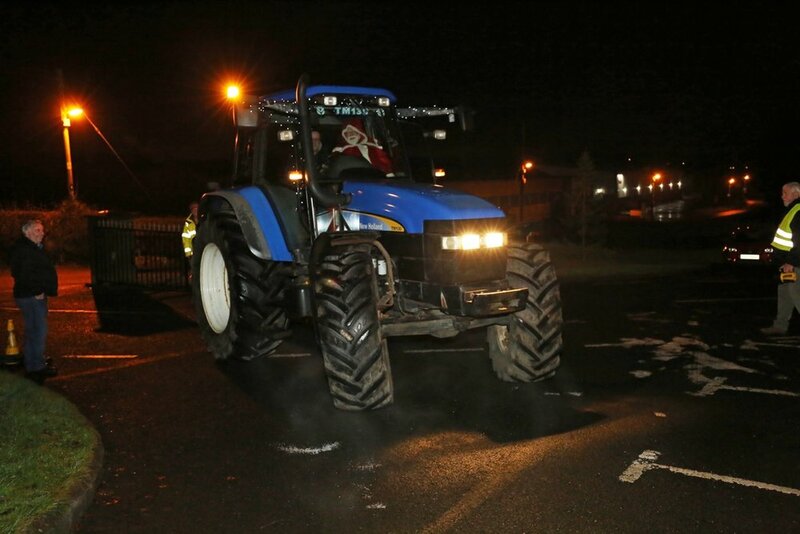 Clearly Santa had remembered how bad the snow had been last weekend and was determined to get through to St Bride's with help from Thomas and his tractor. 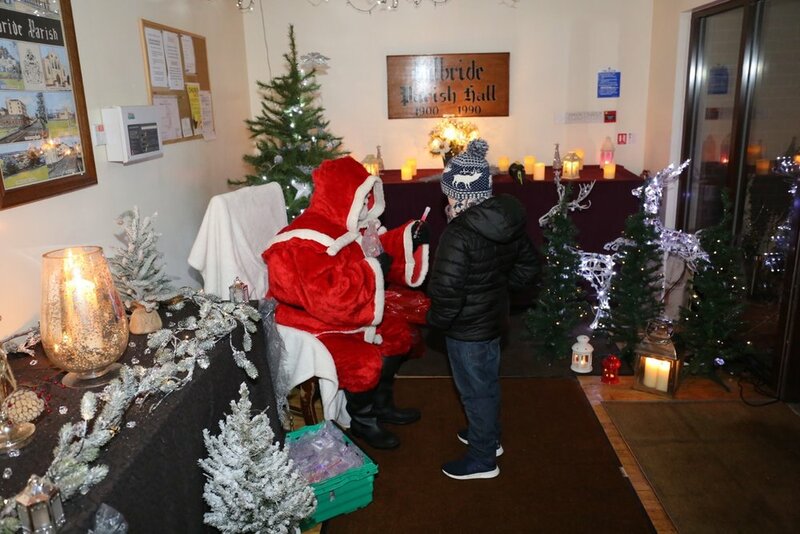 Santa made his way into the special grotto in the hall and gave every boy and girl a present while adults enjoyed mulled wine and mince pies. A wonderful evening and the tree lights will stay on every night until after Christmas Day. Make a point of coming up to see them, maybe before coming to any of the special services being held over Christmas. See the Diary Dates page for more details. This morning's service included another Holy Baptism. The baby's godparents had flown in from Sydney, Australia especially for the occasion and found quite a contrast in the weather and temperature as Kilbride is still covered in snow. The baby boy was baptized Eli and is pictured below with his parents, Louanne and William, his older sister and Canon David Humphries. A beautiful blanket of freshly-fallen snow greeted us all as we opened the blinds this morning. St Bride's church looked particularly lovely as can be seen below and maybe a photo for one of next year's Christmas cards. The church was full almost to capacity this evening as all sections of 1st Kilbride Scout Group came together for their annual Carol service. 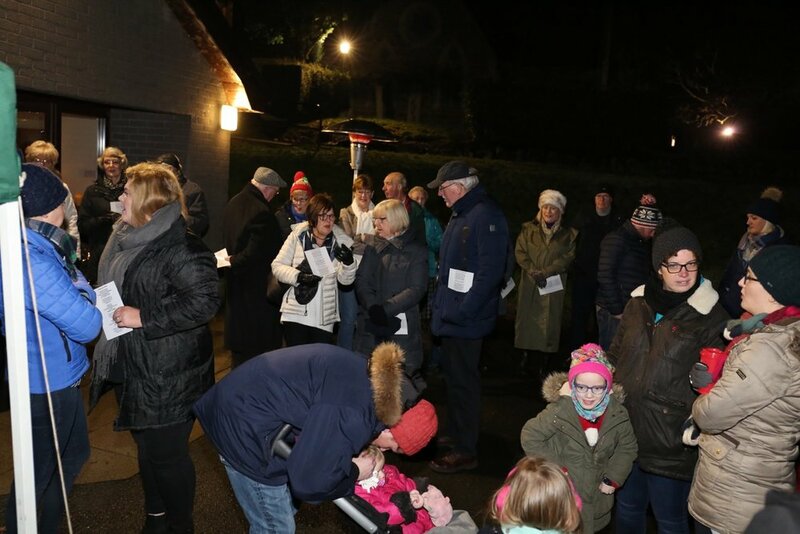 Parents and grandparents of the young people enjoyed singing Carols and watching contributions by the various sections and Christmas Bible readings were read by Cubs and Scouts. This morning's Service of Hymns and Readings for Advent also included a Holy Baptism. 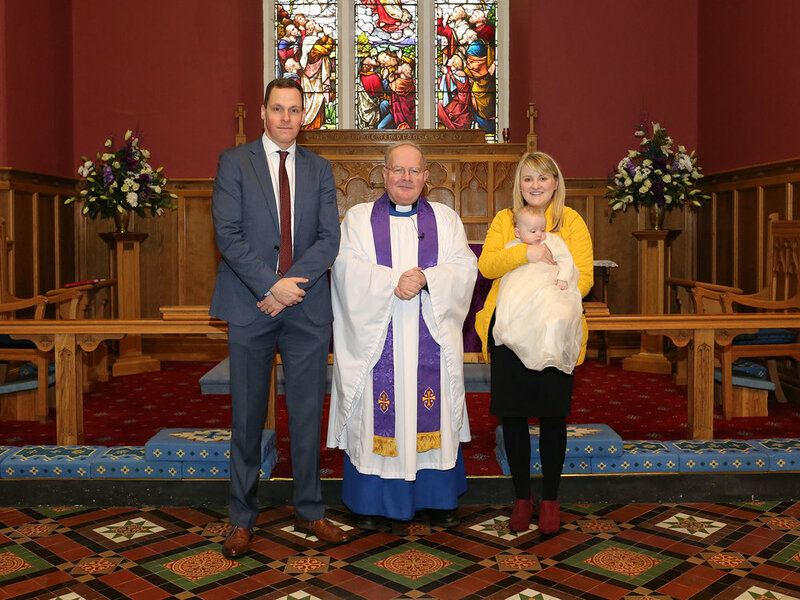 The baby boy was baptized Freddie and is pictured here with his mum and dad, Emma and Lee, together with Rev. Canon David Humphries. 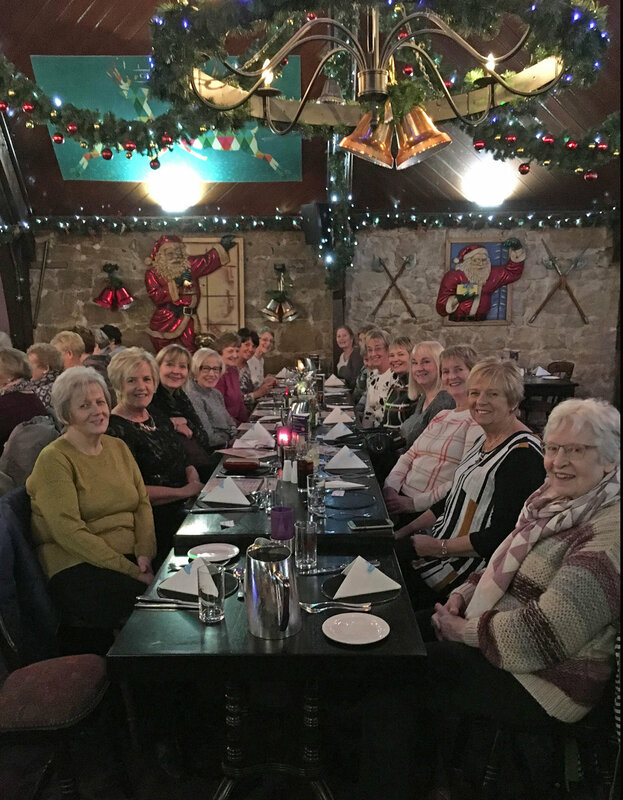 The Ladies Group set off for their Christmas outing in high spirits as they made their way to the Linen Green near Dungannon for some Christmas shopping. The coach was full and the craic was good as they headed west and in little over an hour they had reached one of Northern Ireland's premier retail outlets. After a few hours browsing around the various stores and with credit cards well exercised the next stop was the Viscounts restaurant in Dungannon where everyone enjoyed a delicious meal. It was a great chance for our ladies to relax and get into the festive spirit before the journey home to Kilbride after a thoroughly enjoyable day. St Bride's was delighted to host the Belfast-based group Renaissance for a concert in the church this evening. The audience was treated to a wonderful range of choral pieces, both a cappella and accompanied, including music for Advent, Scottish folk and songs from the musicals. The group's conductor is Rev. Dr Ian Mills and he also played a number of organ pieces by Bach, Ridout and Brahms. The evening's finale was a beautiful rendition of 'A Nightingale Sang in Berkeley Square'. Immediately following the concert everyone enjoyed a chat over a cup of tea in the Parish Room. Members of the church choir and friends got together to celebrate the traditional American Thanksgiving at Beth's home this evening. Following a traditional Thanksgiving meal of turkey with all the trimmings everyone enjoyed singing some Irish and American songs together. 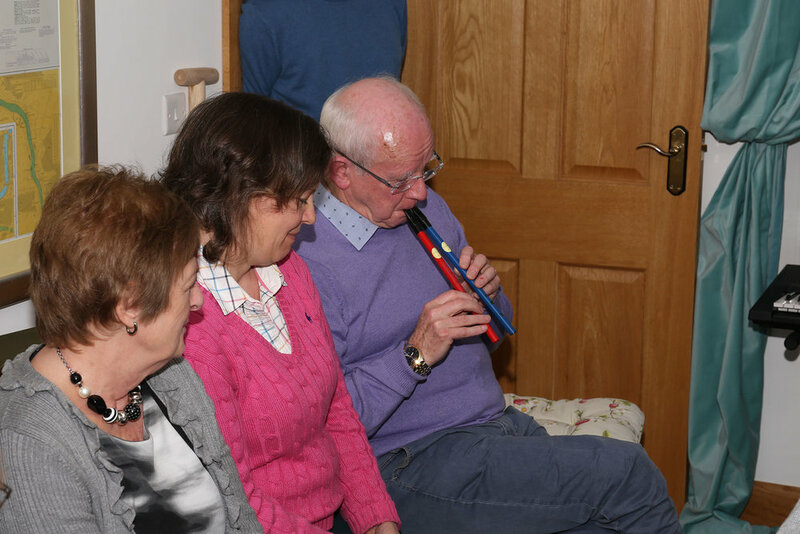 There were also musical contributions from a few individuals; telling stories, singing and playing tin whistles as well as some wonderful accordion playing. It was rugby night for some hardy parishioners from St Bride's as they made their way to the Kingspan Stadium to support the Ulster team against the Italian visitors, Benetton Treviso. The temperature was hovering a little above freezing but the craic was good even though things weren't going according to plan on the pitch as the Ulster boys struggled to get the better of the Italians. Ulster left it late but came through as winners with a minute to go. A great night out for all involved. Congratulations to all of the candidates who took part in this service held in St Bride's this morning. Three young people and six adults were confirmed by the Rt Revd Alan Abernethy, Bishop of Connor during the service which included Holy Communion. "They shall grow not old, as we who are left grow old. Age shall not weary them nor the years condemn. At the going down of the sun, and in the morning, we will remember them." William Hill played the 'Last Post' which was followed by the two minute silence. Reveille broke the silence and brought the Act of Remembrance to a close. A lone piper played a lament as the gratitude of the young was acknowledged by the placing of posies of poppies in front of the Holy Table by a Brownie Guide and a Cub Scout. Many people from the parish have served their sovereign and country in world wars, in international conflicts and in civil strife throughout times past and in recent years. Twenty four men associated with St Bride's gave their lives in two world wars and their sacrifices in particular were remembered with thanksgiving. 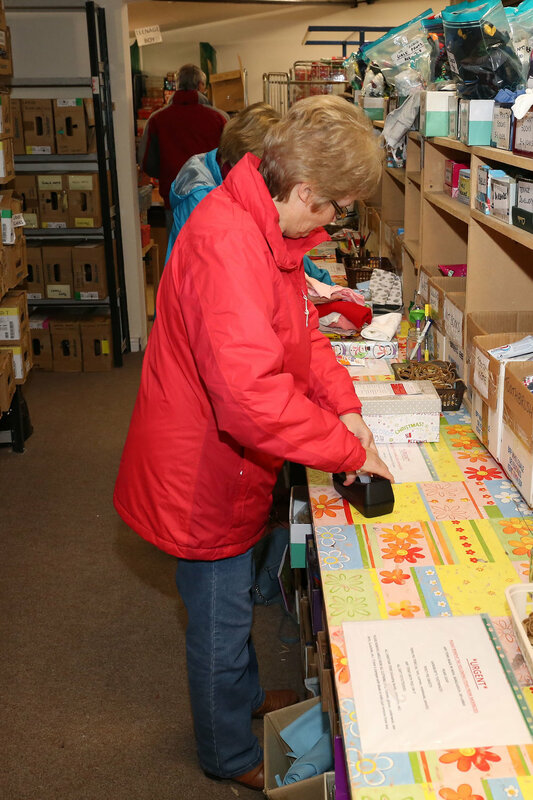 A very productive two hours was spent in the Blytheswood Care shop in Ballyclare this evening as members of the Ladies' Group helped check and pack shoe boxes destined for needy children and adults in various parts of the world. 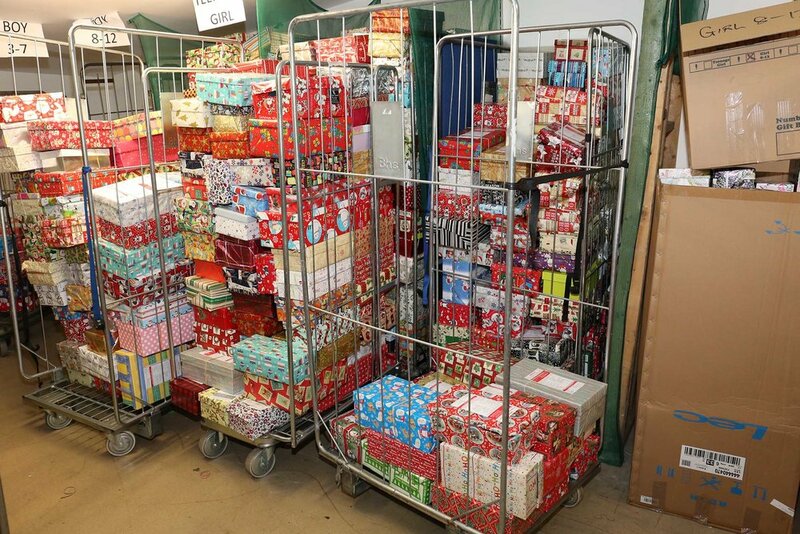 The shoe boxes, each containing items suitable for a particular age group and gender, come to the Blytheswood Care shop from individuals and organisations all over Northern Ireland and are checked by volunteers before being despatched by the container load to locations such as Moldova and Bangladesh. Tonight St Bride's was well represented with a total of seven ladies and three men giving of their time to help out. Beth Aiken, our normal organist, has been unavailable for the past two Sundays but she arranged cover for her absence leaving the playing in the very capable hands of Brian Clements. Brian is the assistant organist in St Columba's church on the Knock Road, Belfast and was very happy to be Beth's replacement for the last two Sunday services. He has enjoyed playing a different type of church organ and spend some time getting familiar with all its subtleties before the first service. The choir members were delighted to work with Brian on both occasions. 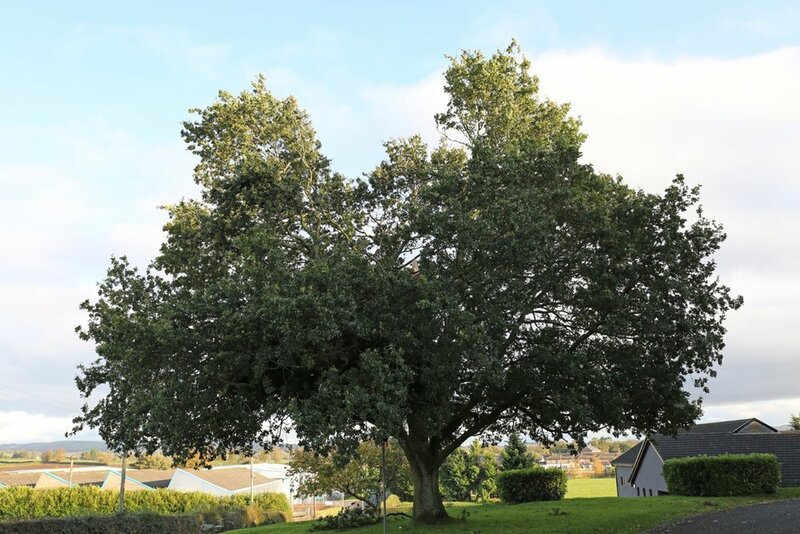 The oak tree that stands in the church grounds and that was badly damaged in storm 'Ophelia' was pruned this morning by a tree surgeon. 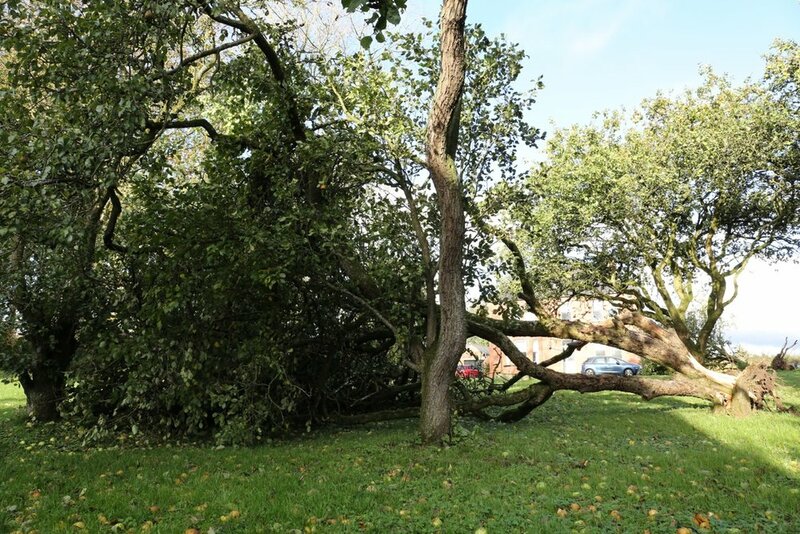 Such was the damage it was deemed that it needed professional attention to access and remove the broken limbs safely with two large branches in particular needing to be removed carefully. 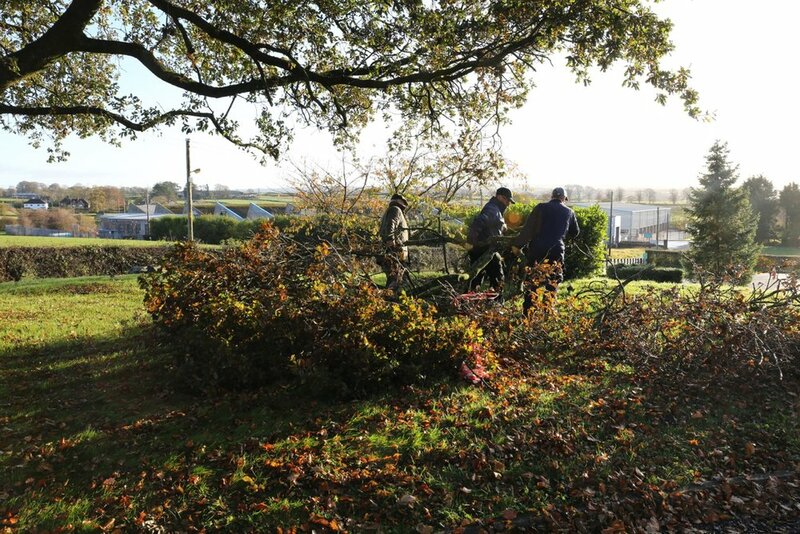 A number of men from the church were on hand to tidy up and remove the felled branches. Another work party will be needed in a few weeks to remove the leaves that have fallen all around the church and the parochial hall since the last clean-up. A date will be announced soon. Congratulations go to Jim Wilson who had the Honorary Freedom of the City of London bestowed on him last week at a ceremony in the Chamberlain's Courtroom in the Guildhall. He was awarded this in recognition of his many years of service on the Bann Division Committee of the Honorable The Irish Society which holds fishing rights on both the rivers Bann and Mourne. Jim is in very select company as famous Honorary Freemen include Winston Churchill, Diana, Princess of Wales and Nelson Mandela. Other recent recipients include Fiona Bruce, JK Rowling and Dame Judi Dench. Jim is pictured with his son Tom and his grandson Stewart. 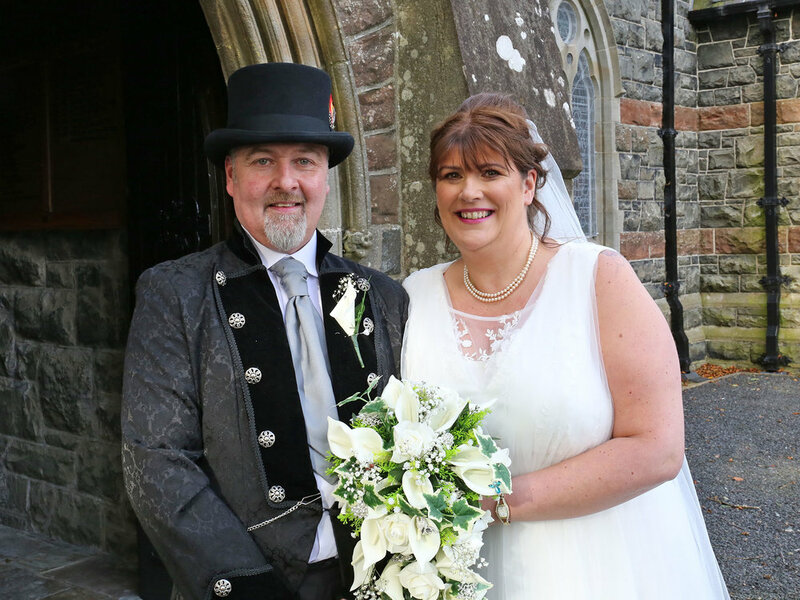 Wedding bells rang out again this afternoon over Kilbride as Delwyn Thompson married Pamela Robinson in a beautiful ceremony conducted by our Rector, Canon David Humphries. 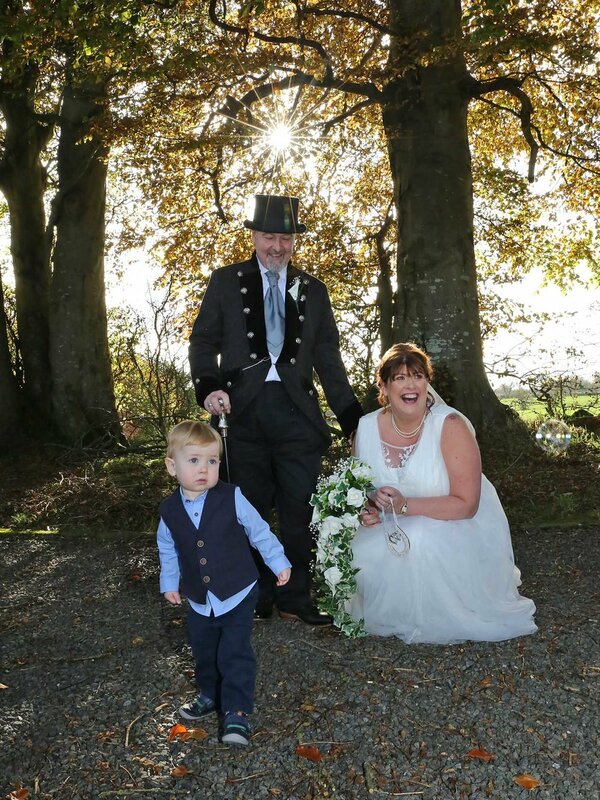 It was a lovely autumn day and the bride and groom were greeted by bright, dappled sunshine coming through the beech trees as they walked out the front door of the church. Best wishes for their life together from everyone in St Bride's. This morning Canon David Humphries lead the publicity launch for next year's pilgrimage to the Holy Land. 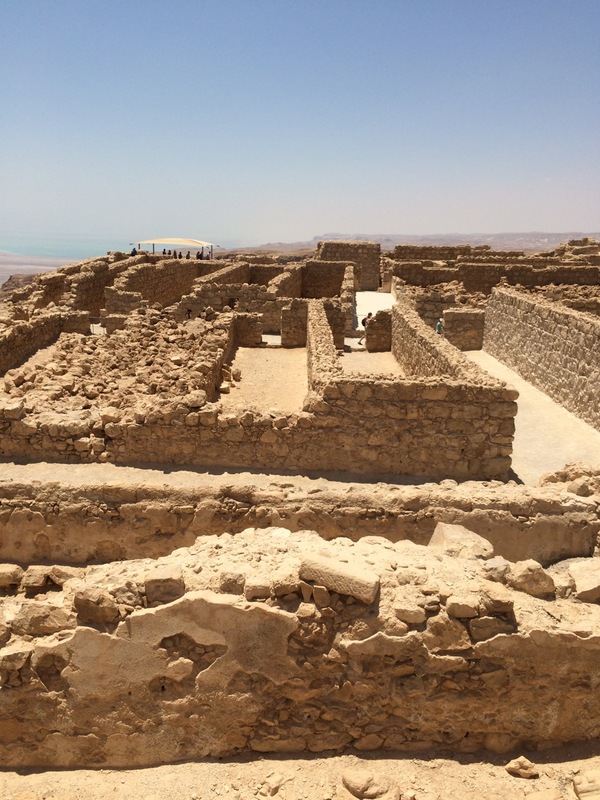 It included a slide-show of images taken on previous trips that he has lead, highlighting many significant Biblical sites that will be included in next year's visit. Rosemary Nutt, from McCabe Travel in England, gave details of the travel arrangements and hotel accommodation. Canon Humphries was also joined by Rev. Amanda Adams and Rev. Andrew Ker who are part of the pilgrimage organising team. 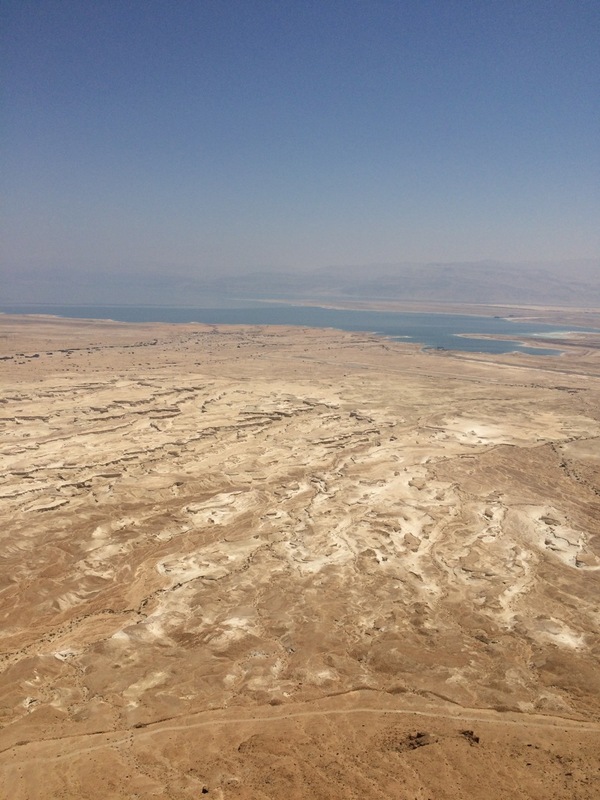 The audience was made up from a number of people who have been on previous pilgrimages as well as some who are giving the trip some serious consideration. David was very pleased with the number who attended and was happy to answer questions from the audience. If you couldn't make this morning's presentation but are still interested please do contact David for more details. A Mediterranean lunch was provided for everyone prepared by Kathryn Hamill and assisted by Heather McLeod, Dorothy Gibson and Barbara Rea. 'Storm Ophelia' has been very prominent in the news over the past few days leaving devastation in its wake as very strong winds swept in from the South, with the Republic of Ireland being particularly badly affected. Sadly three people lost their lives there as a result and our thoughts and prayers are with their families at this very difficult time. Whereas no structural damage was caused to the church, the parochial hall or the rectory the trees close by didn't fare so well. 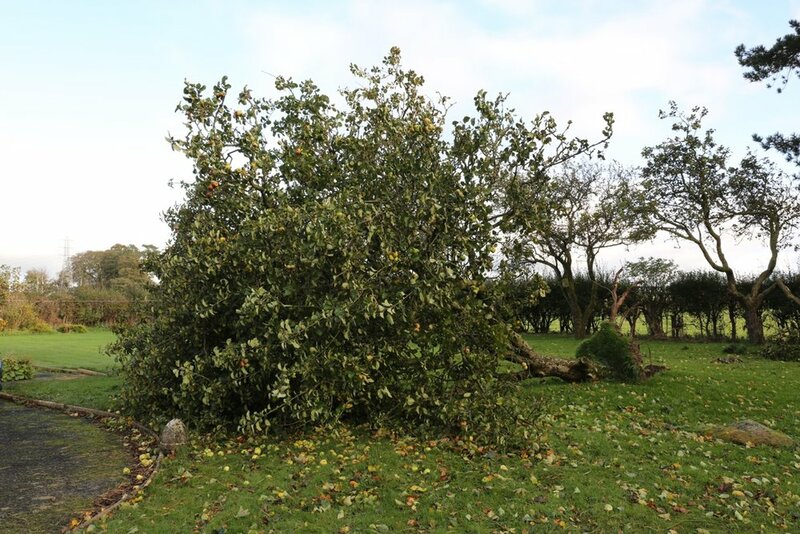 Two mature apple trees which were still in full foliage and completely laden with apples were uprooted in the front garden of the rectory. Both fell on the lawn but no other damage was caused. The garden had around twelve apple trees and the ripe apples which normally have to be harvested while still on the trees were shaken off the branches, such was the force of the wind, resulting in a lawn littered with fruit. 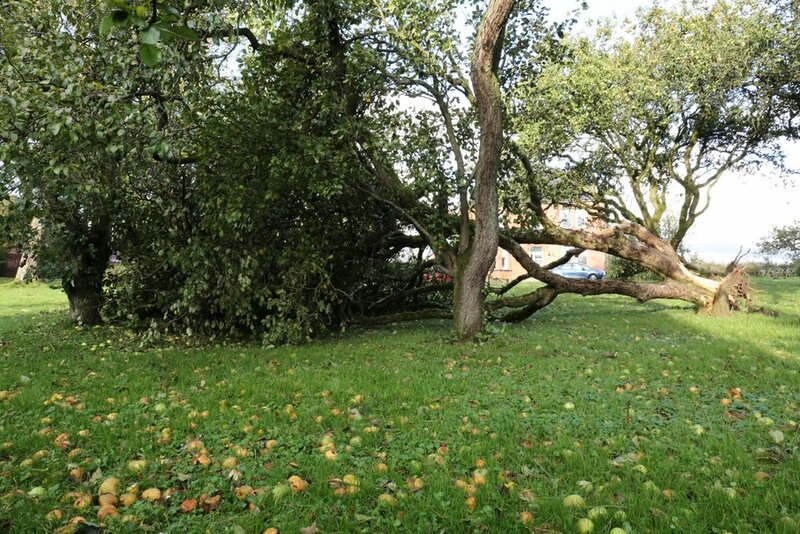 The coronation oak tree which grows close to the church also suffered some damage with two large limbs shattered during the storm. 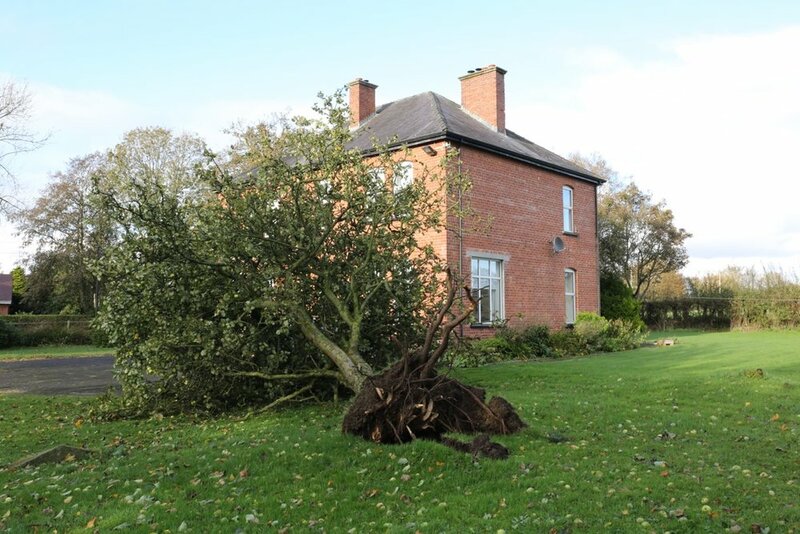 This tree was planted by Diana, 2nd Baroness Glentoran on 2nd June, 1953 and has weathered many storms but unfortunately the ferocity of 'Storm Ophelia' has caused considerable damage. The tree will look a lot different when these large limbs are removed but in time it may return to somewhere near its former beauty. During this morning's service of Holy Communion another baptism was performed by our Rector. 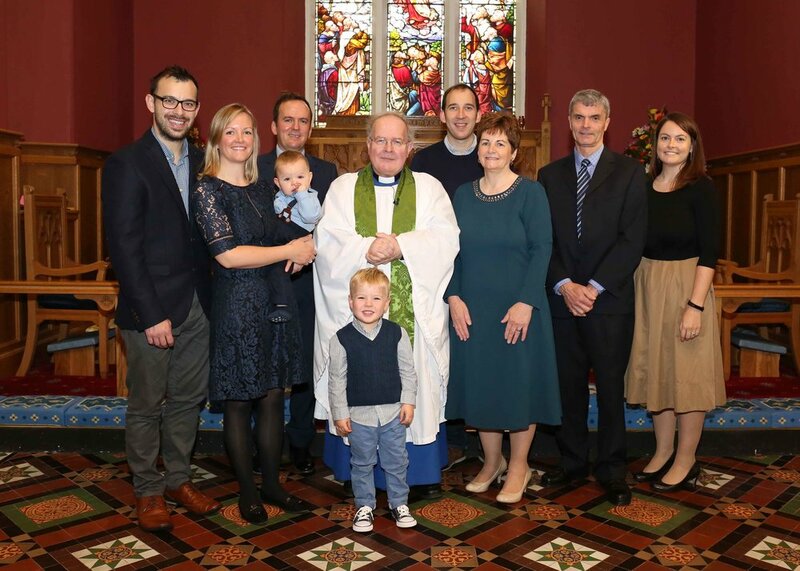 The little boy was baptized Rupert and he is pictured here with his parents, Tom and Margaret, older brother Alex, godparents, grandparents and Canon David Humphries. 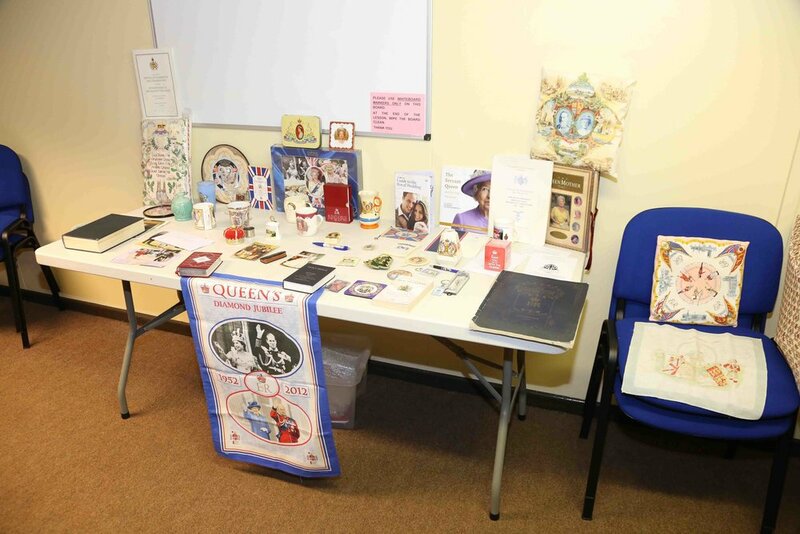 To say that Derek Kerr is passionate about a subject is an understatement in the extreme and that was apparent as he delivered a talk on our Royal family to a very appreciative audience in the Parish Room. The ladies (and a couple of men) were completely amazed at his knowledge of the history of not only the Windsors but the Royal family going back through many different sovereigns. His enthusiasm for the subject rubbed off on everyone there as he described many of the characters within the Royal lineage, interspersed with anecdotal stories of some of his own encounters with notable personalities over the years. An entertaining evening for everyone who attended and sincere thanks to Derek for coming. 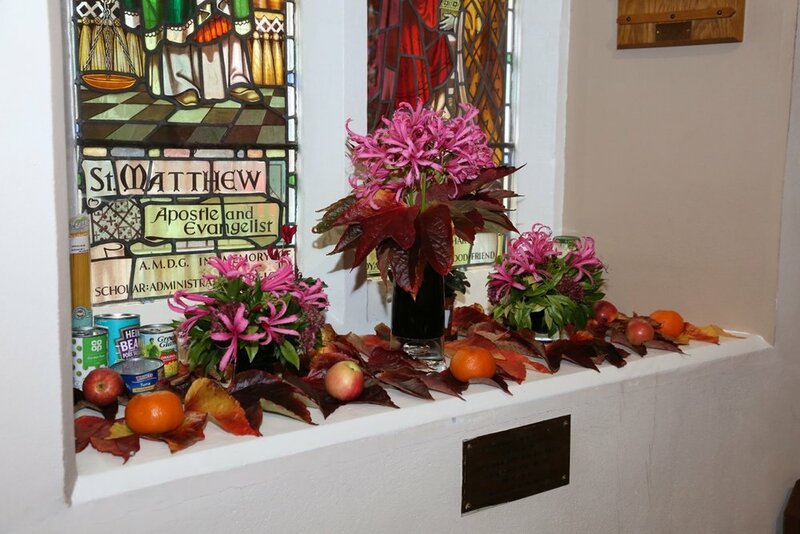 On a mild autumn morning St Bride's church was full almost to capacity as parishioners and visitors attended the annual harvest service. Our Rector, Rev. Canon David Humphries, conducted this his first harvest service in St Bride's, assisted by Rev. Canon Walter Laverty who read the lessons and preached the sermon. Rev. Canon Laverty last visited St Bride's in November last year for the institution of Rev. Humphries when he again preached the sermon. The church choir, conducted by Beth Aiken, sang the well-known anthem 'For the Beauty of the Earth' arranged by John Rutter. 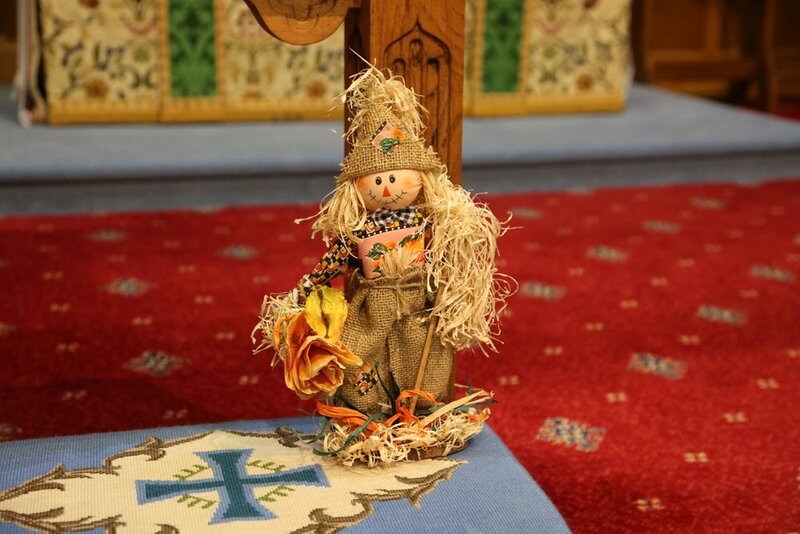 Immediately following the service the congregation was able to enjoy a cup of tea and a chat as they admired the harvest decorations. Fruit and vegetables were sold off with the proceeds being allocated to a school and boys' home in Jerusalem called Jeel al Amal. 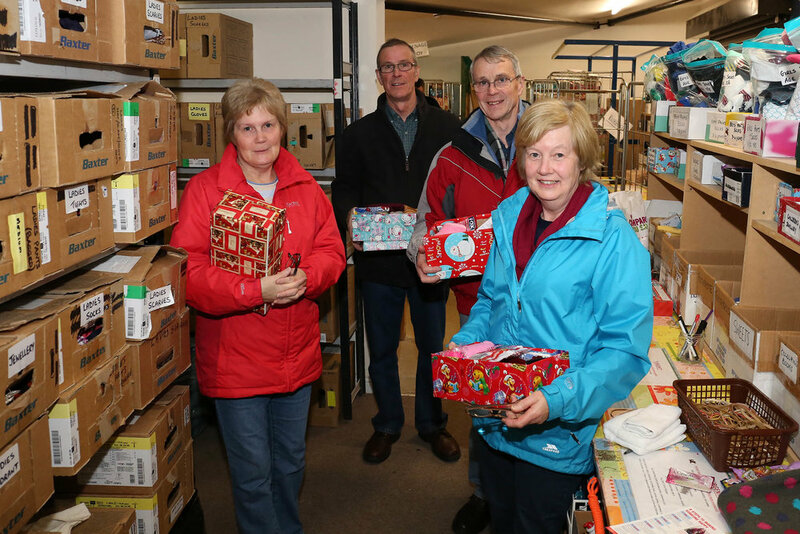 Tinned food will be taken to a charity in Larne. This afternoon the rambling group went on another walk taking in The Newtownabbey Way. 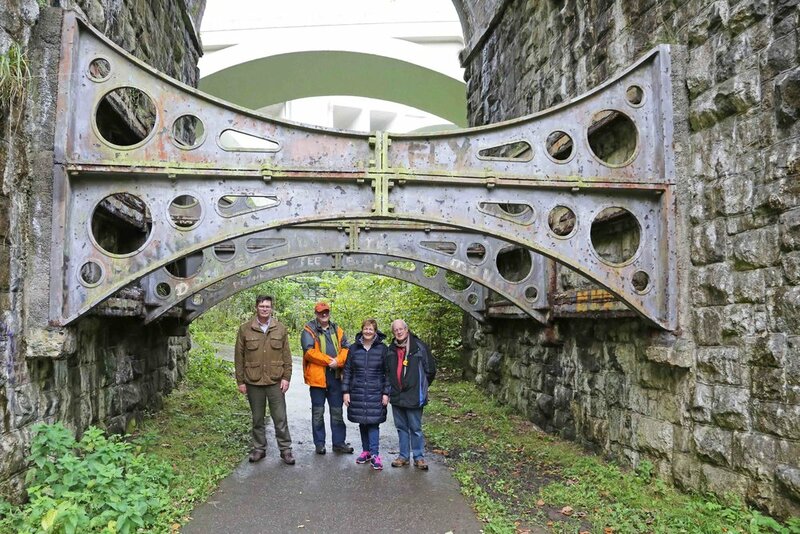 Numbers were down a little on the last outing but the ten who did make it thoroughly enjoyed the walk from Corr's Corner, past Mossley Mill to Monkstown and down the glen and under the very impressive railway viaducts to Whiteabbey. A very pleasant walk with a very autumnal feel and finished off with the now obligatory cup of coffee at the end! Look out for details of the November walk soon on the Diary Dates page. This morning the church was a hive of activity as a small team of workers decorated the church for tomorrow morning's annual Harvest service. 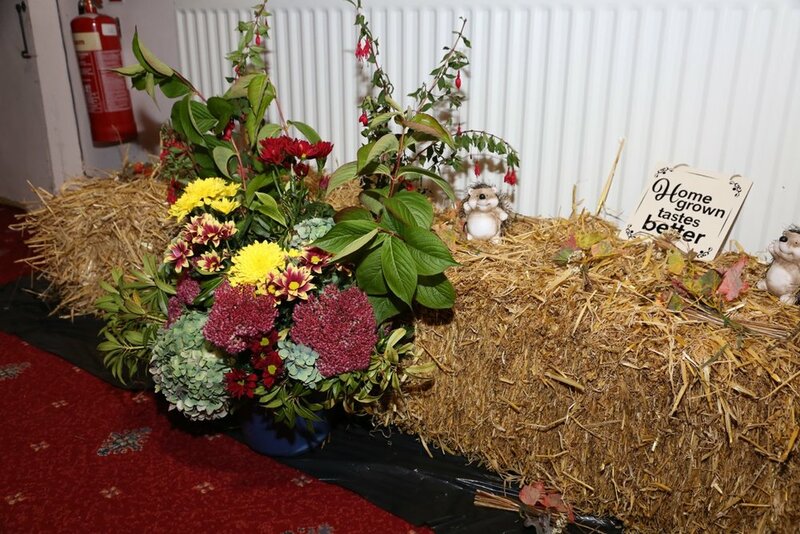 In around two hours the church was transformed as all manner of harvest-related decorations were put on display. Look out for the two little characters at the altar rail! Well done to everyone who helped out - the church looks wonderful. During this afternoon's Choral Evensong service in St Anne's Cathedral our Rector, who is the Chairperson of the Organ Scholarship Scheme, had the pleasure of presenting a certificate to David McClelland who recently completed his studies under the scheme. David plays in St Patrick's church in Coleraine and he visited St Bride's in May when he and a number of other scholars took part in the very successful recital. Our own organist Beth Aiken, who is a continuing scholar in the scheme, also took part in the Evensong service by reading the first lesson. 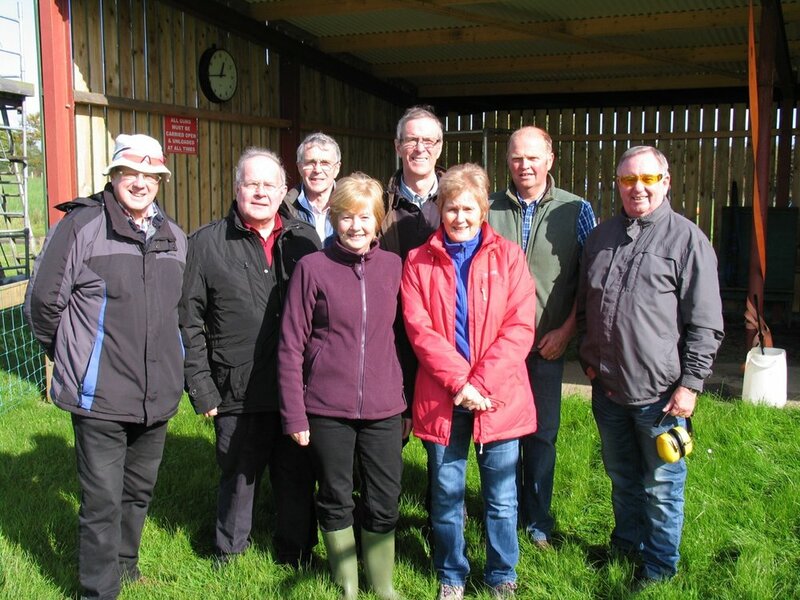 A very enjoyable morning was spent on Donegore Hill where members of the church took part in a clay pigeon shoot. 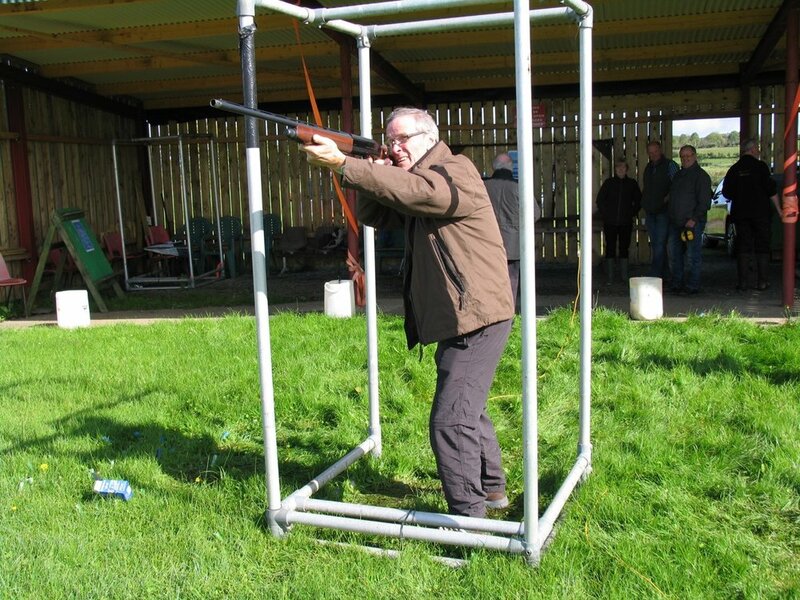 For some it was a completely new experience but everyone had fun and managed to hit the target! Neil Paget had the highest score of the morning. 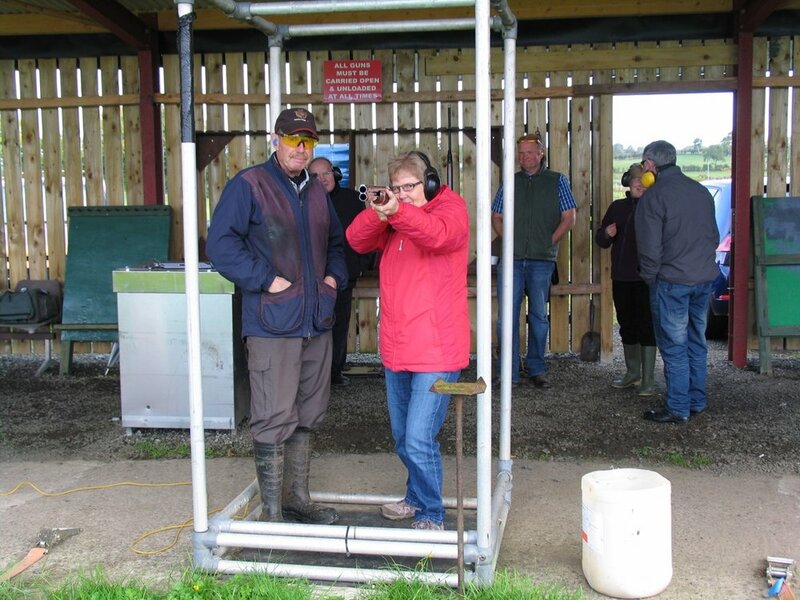 The photographs below show some very stylish techniques (all guns were unloaded so the photographer wasn't in any danger!). Hot dogs were enjoyed at the end. Thanks go to Clarence Gibson for organising this event. This evening more than fifty people took part in a thoroughly enjoyable beetle drive in the Parish Hall. For many it was their first experience of a 'drive' and for others it had been many years since they had last taken part in one. Either way it was a fun-filled evening for young and old. 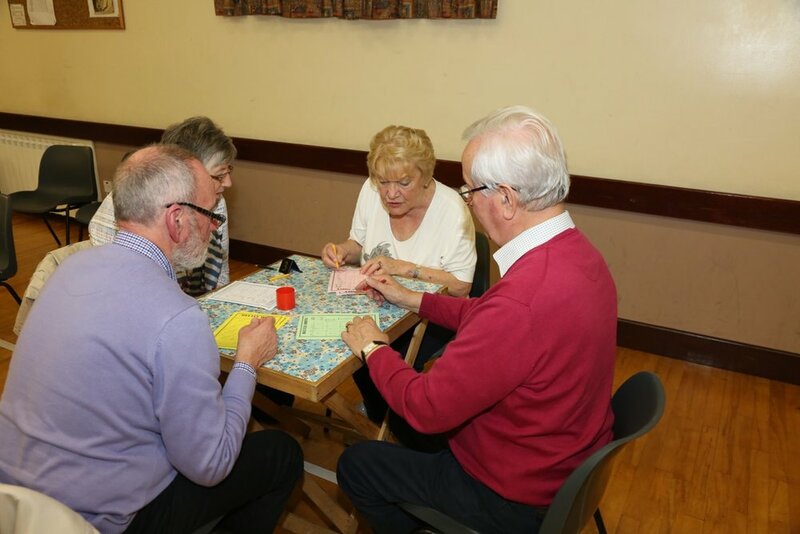 Entertaining and frustrating at the same time as participants did their best to throw a 'six' followed by a 'five' on the dice to get the beetle started. The drawings of the anatomy of a beetle were wide and varied to say the least! This morning's service of Holy Communion also included a Holy Baptism. The baby boy was baptized Eric Ryan and is pictured here with his mum and dad, Lauren and Gary, his older brother Harrison, together with our Rector, Rev. Canon David Humphries. This was the first meeting of the season for the Ladies' Group and the theme for the evening was craftwork. The ladies of the Parish had a very enjoyable evening making various decorations using old paperback books. 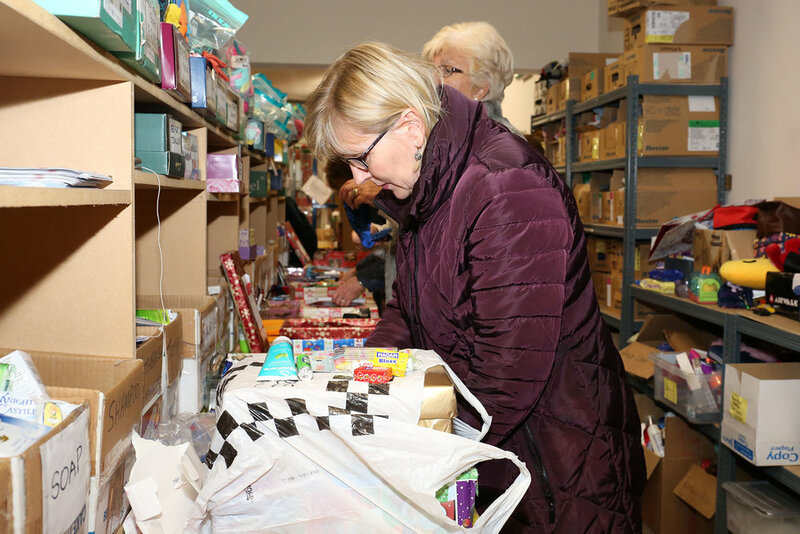 Sandra Peoples was the guest and she demonstrated how to create some truly beautiful pieces before the ladies got down to some serious paper folding and decorating. A cup of tea at the end was very welcome. If any other ladies would like to come along and enjoy the company the next meeting is on Wednesday, 11th October when the guest will be Rev. Derek Kerr from Randalstown who will be giving a talk on the Royal family. All are welcome. See the Diary Dates page for more events. Sandra Peoples with some committee members. During this morning's service a special announcement was made by Mr Ivan Topping regarding the condition and future plans for the Rectory. Ivan is Secretary of the Select Vestry and in his report he detailed the history of the building and the maintenance requirements that have been a cause of concern for members of the Select Vestry for many years. Ivan also described in detail the influence that the Representative Church Body of the Church of Ireland has on any future plans the Parish may have for the Rectory. Ivan then explained the steps that need to be taken next regarding the existing Rectory and any new development that is deemed to be appropriate. To read the report in detail please follow the link below where the full text of Ivan's report can be seen. 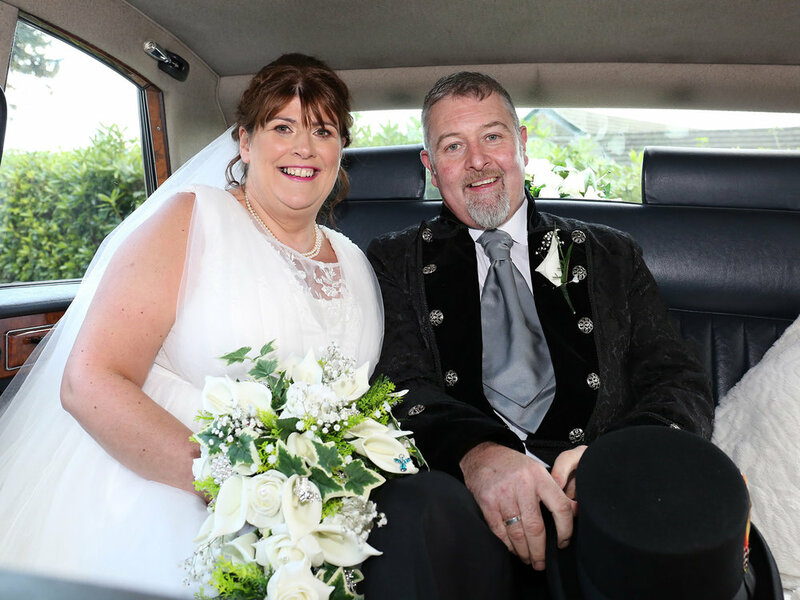 The wedding took place today of Robyn James and Graham Scott. This was the third wedding that our Rector has officiated at in less than a year. Congratulations to the happy couple from everyone in St Bride's. This evening's walk was along the banks of the Six Mile Water near Antrim. 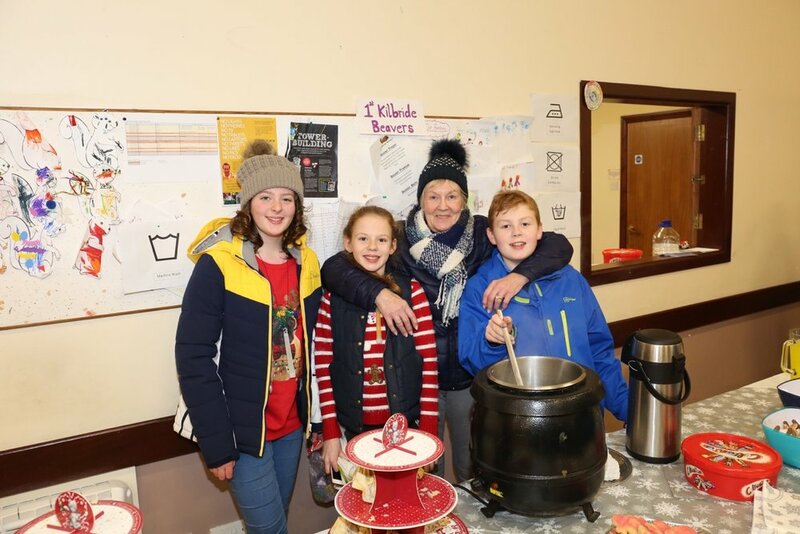 The group of fifteen walkers met at All Saints' Church in Antrim and was greeted by one of the very heavy showers that had been forecast for the evening. Luckily it cleared in time for the start of the walk along what is known as the Mill Race Trail. The route took the ramblers from All Saints' in the town centre along the banks of the river before emerging out of the trees on the Oldstone Road near Muckamore. From there it was a brisk walk back to the town centre and thankfully it stayed dry throughout. Refreshments and great conversation were enjoyed in Ellie May's in Dunadry on the way home. Another thoroughly enjoyable gathering to end the summer's evening rambles. Walks will switch to Saturdays now, and once a month only, so look out for details on the Diary Dates page in the coming weeks. Please note that due to unforeseen circumstances the shoot organised for this Saturday has had to be postponed. It will now take place on Saturday, 30th September. All other details remain the same. A small number of St Bride's choir members attended the Come and Sing evening in St Mark's church in Armagh. This event was being held as part of the Charles Wood Festival of Music which is held annually in various venues in Armagh. This evening's event was attended by in excess of three hundred people from all over Northern Ireland and beyond who came together in this most beautiful church to sing some well known pieces such as 'O Praise Ye the Lord' and Handel's 'Hallelujah Chorus' as well as numerous pieces written or arranged by the conductor for the evening, the famous John Rutter, and all with a minimum, if any, rehearsal. The Charles Wood Singers also sang some individual pieces which were very well received by the audience. Carnfunnock Country Park was the venue for this week's walk. Again a light shower of rain signalled the start of the walk as the ramblers set off around a number of routes in the park. A few of the more adventurous walkers in the group took the woodland trail which led to Ballygally while others stayed within the confines of the main park. No-one ventured into the maze deciding instead to keep to the marked paths. Exertions over many of the group made their way to the Meeting House in Cairncastle for some chips and refreshments. Another very enjoyable evening. This week's walk was a little closer to home in Ballyboley forest and despite a poor forecast the group assembled in the forest car park for a walk around the forest tracks. It was new territory for some of the walkers but undeterred by the downpour at the start the group of sixteen set off to explore. Thankfully the rain soon stopped making walking much more enjoyable. 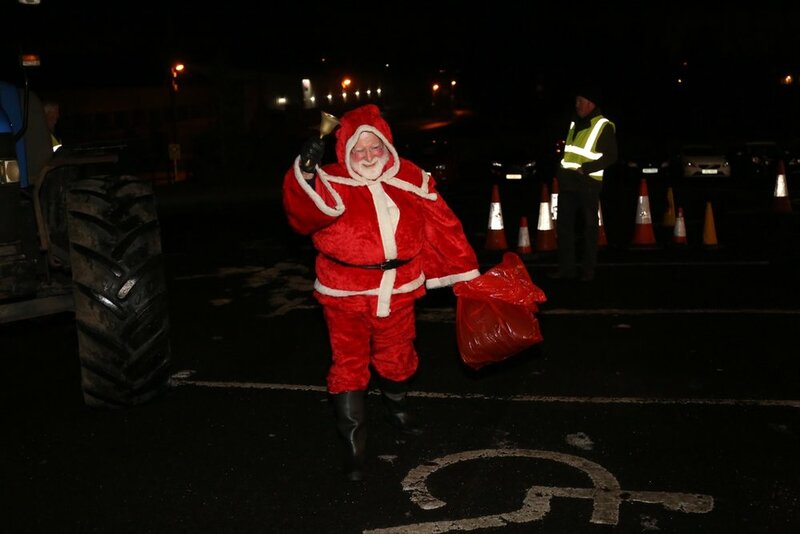 A few new recruits joined many of those who had been in Whitehead last week and all enjoyed the walk. Sunshine ordered for next week so look out for details soon on the Diary Dates page. Make a note in your diaries and bring a friend! A very pleasant evening was spent on the rambling group's first outing taking in the superb views from the Blackhead lighthouse near Whitehead. Twenty walkers enjoyed a walk along the coastal path and up a considerable number of steps to a vantage point overlooking Whitehead, with views to the Copeland Islands, the north Down coast and Scotland. The weather was warm and it was an almost cloudless sky which made for an enjoyable walk. A short car journey took everyone to the Rinkha for a well-earned coffee or ice cream - some had both! Another walk is being arranged for next week so look out for details soon on the Diary Dates page. The newly-formed rambling group will be going on its first outing on Wednesday, 9th August. See the Diary Dates page for more information. Over the past few weeks our Rector and our organist have each taken a well earned break. We have been very fortunate to have the Rev. Wallace Fenton standing in for the Rector with Mr Cecil Millar and Mr Neil Paget on organ duty. Well done to Clarence Gibson as he took part in the Dervock Half Marathon this morning to raise funds for St Bride's. The run started and finished in Dervock and took in some of Co. Antrim's most beautiful scenery including the Dark Hedges. If you haven't sponsored Clarence yet see him soon. All donations very welcome. Today our rector officiated at his second wedding in St Bride's as Sarah Robinson married Gary Davis. Best wishes to Sarah and Gary from everyone in St Bride's as they begin their married life together. A huge thank you to everyone who contributed so generously to Christian Aid Week. The Church collection raised £415.83. On behalf of Christian Aid and those who will be served in your name, a very big Thank You. Scott Ballentine from the Adopt-A-Child charity, who visited St Bride's this morning. Just a reminder that the prizes for Sunday School attendance will be distributed this coming Sunday. Hopefully all the young people in the Sunday School be able to be there. 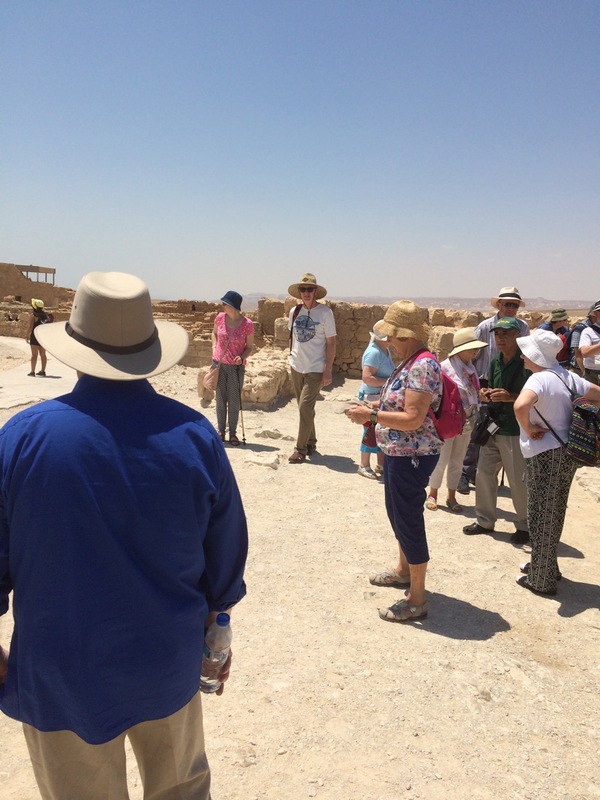 A large number of photos were sent through today and clearly our pilgrims have been busy visiting numerous sites. 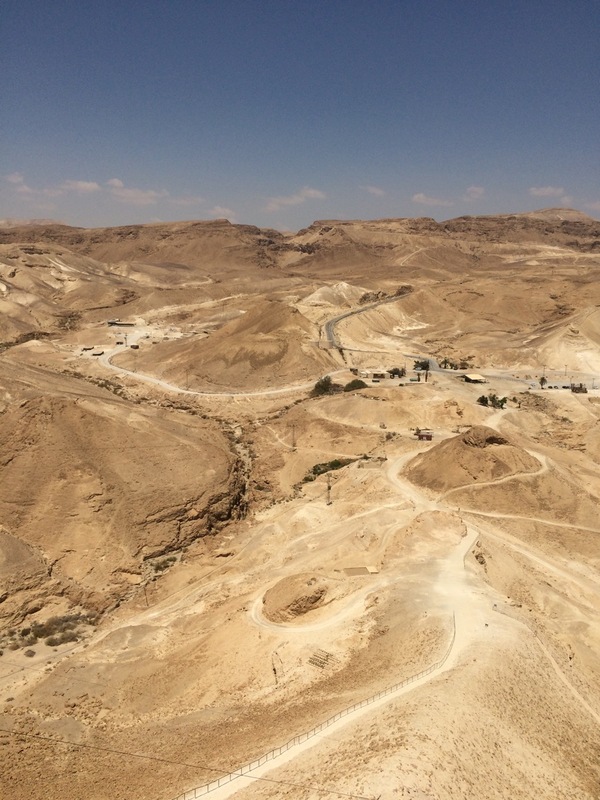 If you would like to see a documentary on pilgrimages to the The Holy Land visit the BBC iPlayer site and search for the recent programme called Pilgrimage with Simon Reeve. You will need to create an account with the BBC, which is quite simple, and then search for the programme. Many of the places that are being visited by our own parishioners are covered by this programme. It will be available until the end of June and is well worth watching. Photos sent back today show St George's Greek Monastery as well as a shrine to Moses inside a mosque. 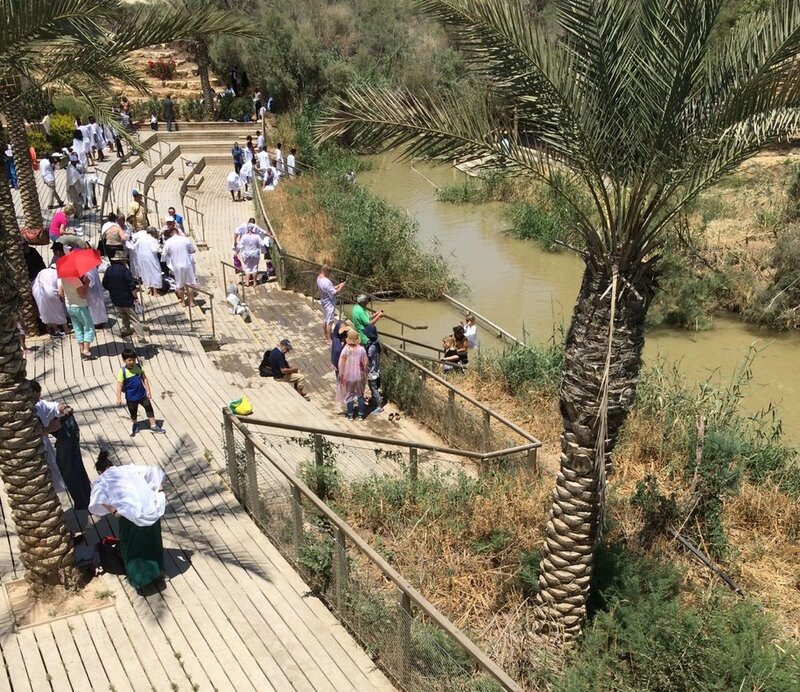 There are also some of baptisms being performed in the River Jordan. Some pilgrims are dressed in white baptismal robes. 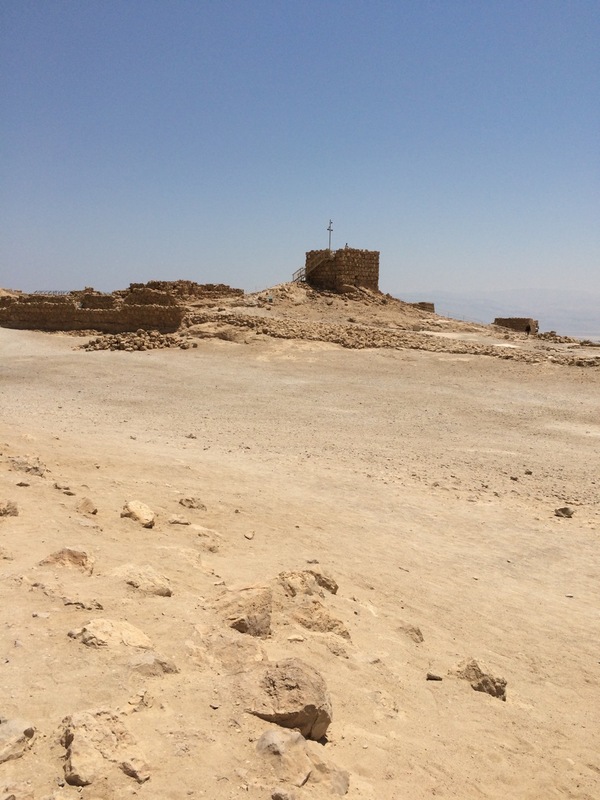 Today's photos show the ancient fortress of Masada, accessed by cable car. 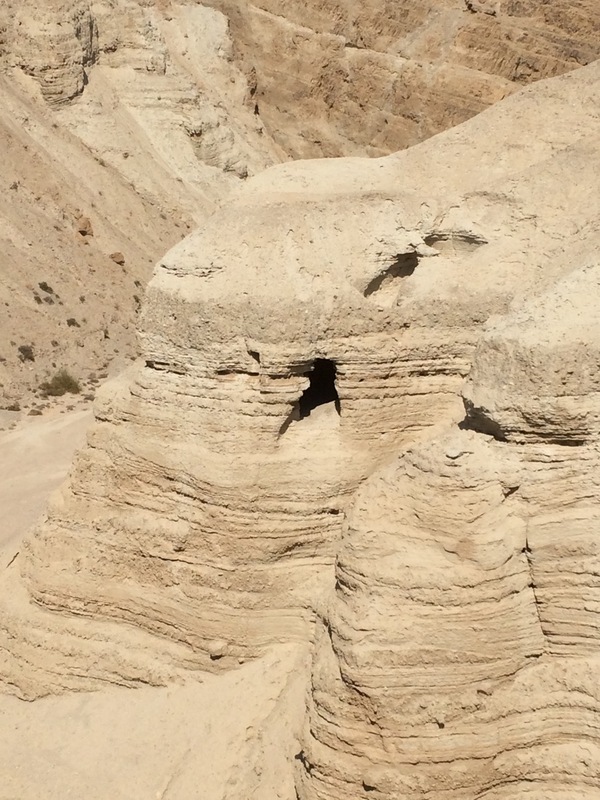 It is located in the southern district of Israel and it was designated as a UNESCO World Heritage Site in 2001. 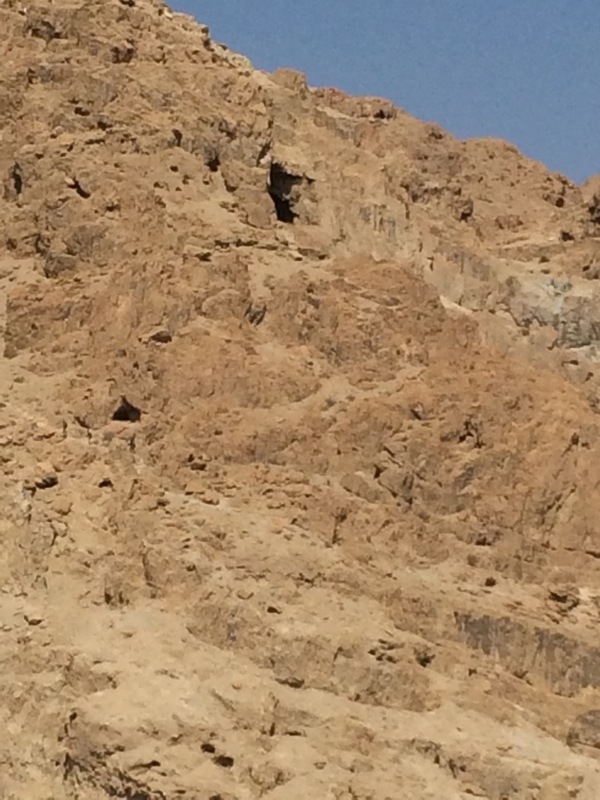 Also included are some of the area where the Dead Sea Scrolls were discovered. The pilgrims from St Bride's were exploring the site of the Garden Tomb, just outside the old walls of Jerusalem, in the past few days. A new page was added to this website which, over the coming months, will give details of events and general information relating to the celebrations being planned for the 150th anniversary of the consecration of St Bride's on 9th June 2018. There is an on-line form to complete if you have any suggestions for items to be contained in a time capsule that will be buried in the grounds of the church. This afternoon the second recital in the Kilbride Recital series took place in the church. 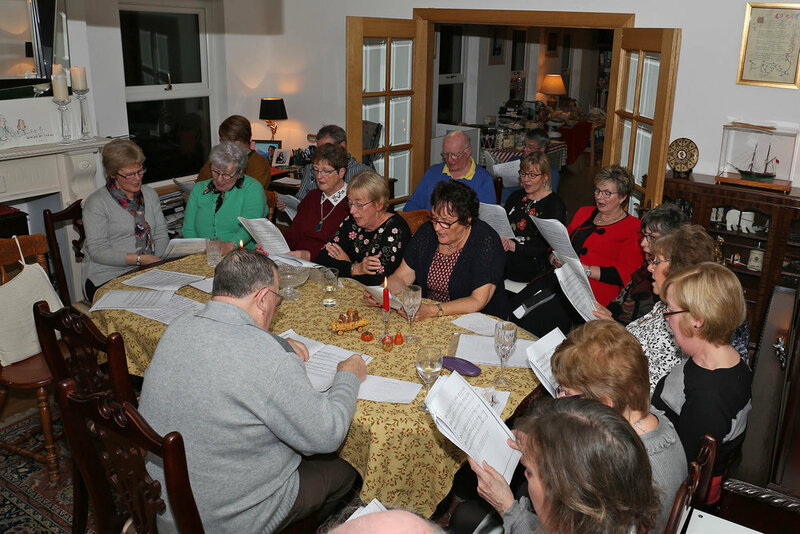 An audience of over eighty music lovers were entertained by a wide range of music as well as poetry readings. Participants in the Down & Dromore and Connor Organ Scholarship Scheme came together to demonstrate their considerable skills on our church organ. Scholars who took part were Beth Aiken, David McClelland, Vivien McCullough and Jamie Howe. David, our rector, and Beth, our church organist, combined their well honed skills as they played a piano duet. The very appreciative audience also heard the talented Howe family with pianist Tim Howe accompanying Hayley Howe both as a soloist and later playing the violin. Jamie Howe had a virtuoso performance on the violin. Billy Cairns played a medley of well known music on the piano much to the approval of the audience. David Holmes also performed a solo accompanied by Beth Aiken. Poems written by local poets were read by Tom Andrew, Kate Henry, Rev. Canon David Humphries, Betty Girvan, Lillian Lyttle, Barbara Rea and Dr Joe McKee. 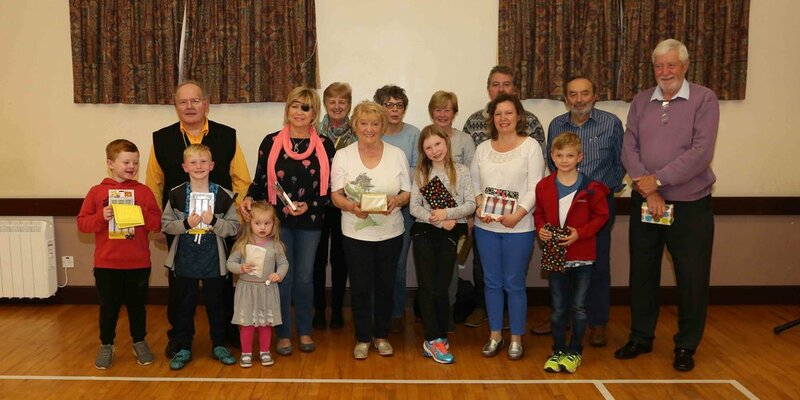 Donations of over £300 were received which will be used to support the planned music programme during next year's 150 year church anniversary (look out for more information on special events for this special year in the coming months). Musicians, singers and readers who took part in the Kilbride recital. Scholars of the Down & Dromore and Connor Organ Scholarship Scheme - Beth Aiken, Vivien McCullough, Rev. Canon David Humphries (chairperson), David McClelland and Jamie Howe. Today our rector officiated at his first wedding in St Bride's as Felicity Cinnamon married Stephen Foster. Congratulations from everyone in St Bride's as they begin their married life together. It's in the diary! This Sunday 21st May at 3 p.m., Kilbride Church of Ireland, Doagh. Do come out and support this 'Afternoon of Music and Poetry' performed by local musicians including Beth Aiken, Organist at Kilbride Parish Church, organ scholars from across the Diocese, Mr Billy Cairns, and the ever-talented members of the Howe Family (vocals, violin, piano and organ) . The programme will range from Bach Preludes and Fugues to Percy French ballads with recitations of poetry on local topics composed by Hewitt, Heaney, Hunter and Janette McKendry. Admission is free, and there will be a retiring collection in support of the music programme of the Church's Sesquicentennial to be held in 2018. The concert will last around an hour, and families are most welcome. This article appeared in the Newtownabbey Times today. The Rev. 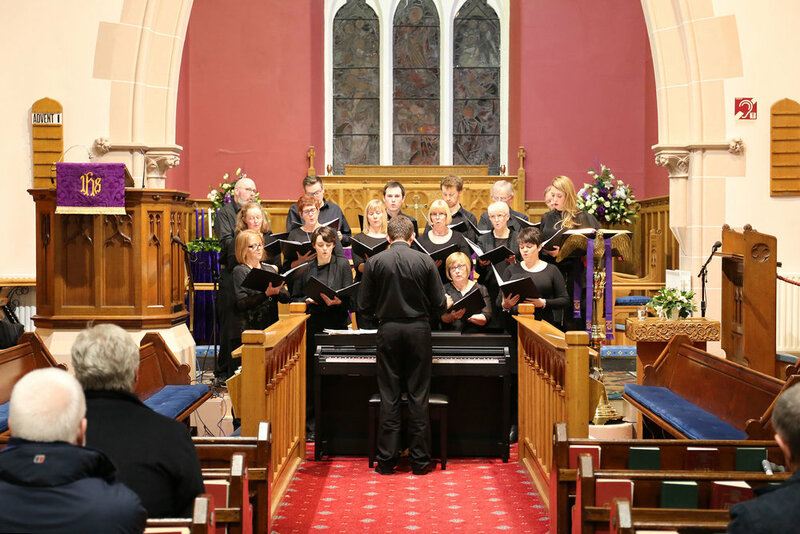 Canon David Humphries has announced that Kilbride Church of Ireland, Doagh will this Sunday at 3:00pm host the latest of a series of captivating music recitals. With performances by the Director of Music, Beth Aiken, six Organ Scholars, the Howe family and Mr Billy Cairns on piano, the event promises to bring quality musicians together and quality music to the community. The Ladies' group held its AGM this evening and elected new office bearers for the incoming season. Chairperson - Dorothy Gibson; Secretary - Brenda Campbell; Treasurer - Lillian Lyttle; Committee members - Shirley Wilson, Hilary Little and Heather McLeod. Look out for the events list for next year in the near future. This afternoon saw St Bride's almost full to capacity as Kilbride Parish hosted a district Masonic service. Our rector, Rev. Canon David Humphries, conducted the service and the church choir sang the anthem, All in the April Evening. Refreshments were enjoyed in the parochial hall immediately after the service. Avril very kindly brought her MBE medal into church this morning where it was put on display for everyone to see. Avril had a wonderful time at Buckingham Palace and was delighted to have met Princess Anne, The Princess Royal again. The Princess presented the award and Avril enjoyed a short conversation with her during which she thanked Avril for her long and dedicated service with Riding for the Disabled Association. Avril made the trip to London with her family who all thoroughly enjoyed the visit to the 'Palace'. The Ladies' Group had a fantastic time on their excursion to Kildare Village shopping outlet. It was an 8:00am start and with the bus almost full to capacity they made the long journey south with one stop for refreshments just north of Dublin. The ladies managed to spend around 5 hours on some serious retail therapy only interrupted by a delicious lunch in an Italian restaurant. It's a tough life but someone has to do it.... A good time was had by all and everyone arrived home safely before dark. It's 8:00 o'clock - let's go! Let's shop till we drop! The bag ladies.. Some months ago Avril heard that she had been awarded the MBE in the Queen's New Year's Honours List. Today she visited the 'Palace' to receive her well deserved award which was presented by The Princess Royal who, by happy coincidence, is also President of the Riding for the Disabled Association. Avril is pictured here outside Buckingham Palace with her proud husband, Desmond. Very many congratulations from us all in Kilbride. For more information on Riding for the Disabled Association click on the link. 1st Kilbride Scout Group was well turned out for today's St George's Day Parade in Greenisland. More photographs of the boys can be seen on the Scout page. This morning's service was a celebration of the Feast of the Resurrection. The service was well attended and the praise was enhanced by our guest trumpeter, Anna Brittain. The choir sang the Easter anthem 'Hail the Day that sees Him Rise' by Mark Wilberg, accompanied by our own Rector playing the organ and supported by Anna, while Beth Aiken conducted. Our sincere thanks to Anna for her wonderful contribution to our service. A recording of this anthem can be found on the 'Choir & Music' page of this website. 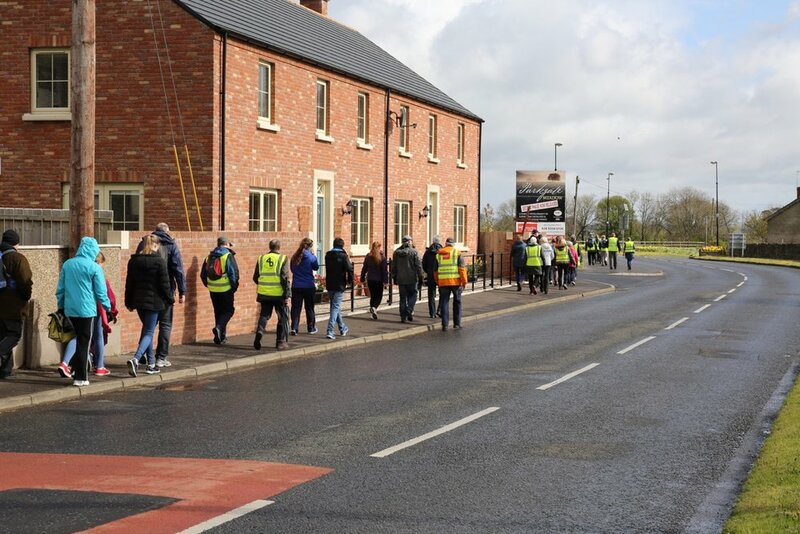 A number of parishioners from Kilbride Parish joined around 40 other walkers from various local churches for the 7 mile Walk of Faith around the district. 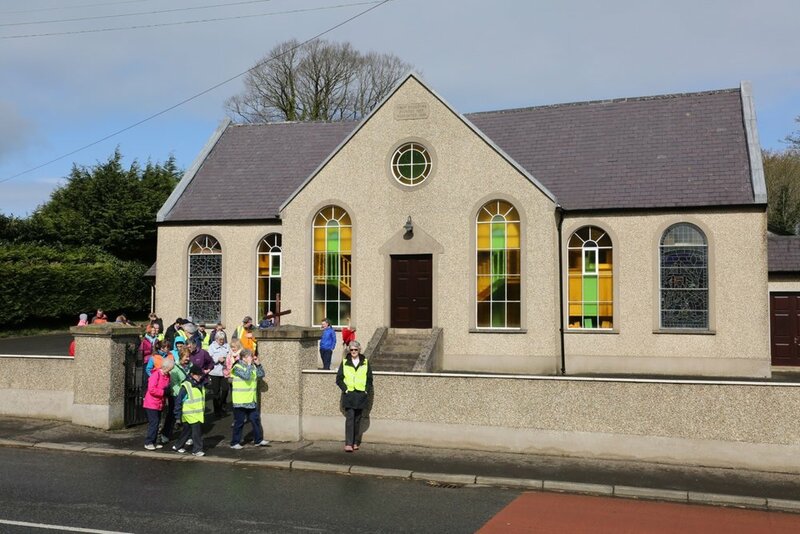 It started at Dunamuggy Presbyterian Church with stops at Parkgate, Doagh and Burnside before its finish at Kilbride Presbyterian Church. The weather was cool and generally sunny with a few light showers but spirits were high throughout and everyone enjoyed some well earned refreshments at the end. Photographs taken at 1st Donegore Presbyterian Church, Parkgate. The Holy Week services concluded with tonight's Good Friday service of reflection with hymns, readings and prayers. Tonight the Maundy Thursday service with Holy Communion was held. The monologue was entitled 'The Voice of Faith - The Centurion' and was spoken by Rev. Wallace Fenton. The third Compline service of Holy Week was held this evening. The monologue was entitled 'The Voice of Faith - The Thief' and was spoken by Rev. Wallace Fenton. The second Compline service of Holy Week was held this evening. The monologue was entitled 'The Voice of Hatred - The Mob' and was spoken by Mrs Jean Fenton. The first Compline service of Holy Week was held this evening. The monologue was entitled 'The Voice of Deception - the Chief Priests' and was spoken by Rev. Wallace Fenton. This morning's service took a very different format from normal Sundays. Parishioners met in the church hall and processed up the path to the church, led by a donkey. 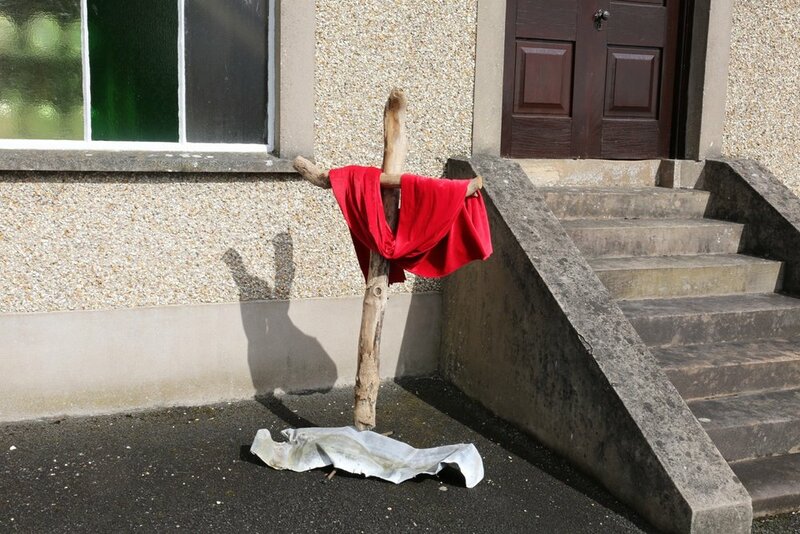 This procession was symbolic of the entry of Jesus into Jerusalem and marked the start of Holy Week in Kilbride. The children's address by our Rector will be remembered for a long time by the presence of 'Annie' in the church. More photographs of the procession can be seen in the Gallery page of this website. The Easter General Vestry meeting was held this evening in the Parish Room immediately following a short service in church. There was a good attendance at both and the business of the evening was conducted efficiently with the meeting being chaired for the first time by our new Rector. New parochial officers were elected and their names are listed on the 'Our People' page of this website. Click or tap on images below to enlarge. Tonight's service was well attended by both parishioners and visitors to our church. The anthem, A Prayer of St Richard of Chichester, was performed by the church choir and was well received by the congregation. A monologue gave an insight into the possible thoughts of Judas Iscariot in the days before and after his betrayal of Jesus. Saturday night saw the parochial hall well filled to listen to a wonderful evening of music, singing and yarns. Many of the artistes are well known in Kilbride and they were made very welcome by a very appreciative audience. 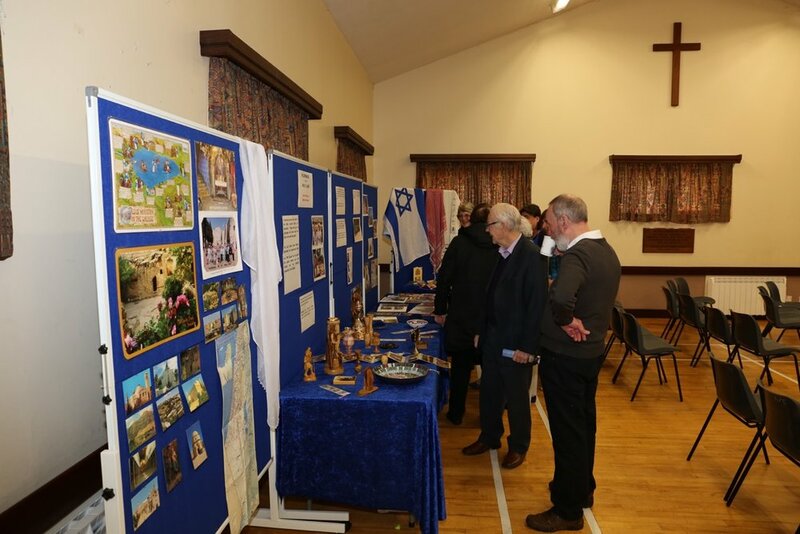 Praise must go to the organisers, our Kilbride's own George and David Rea, who pulled the evening together with a rich mixture of different talents, including their own. Isabel Crowe, Jack McKinney and Tom Andrew were the story tellers with Billy Cairns on piano, Bobby Cameron, Reggie Moore, David Rea, George Rea and Conal Harris on accordion. Conal also played a number of pieces on a genuine tin whistle. Kenny McCullough and Michael Rodgers were the fiddlers. Wilfie Crowe sang a number of Percy French pieces accompanied by Isabel Crowe. Light refreshments were provided by the ladies during the interval. 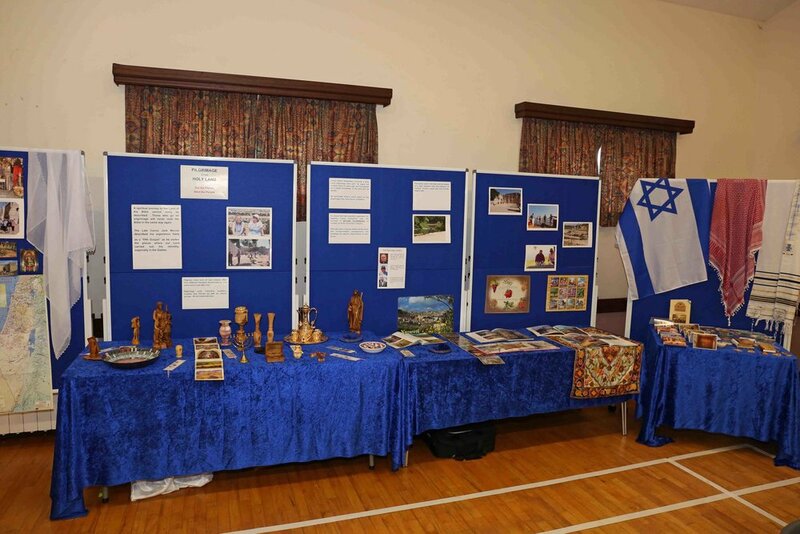 A highly commendable £750 was raised for church funds. George and David hope to repeat this very successful evening later this year. More photographs can be seen in the Gallery section of this website. Listen to some of the music from Saturday evening by clicking on the 'play' symbol below. St Patrick's Day is this coming Friday but we decided to celebrate our Patron Saint's Day a few days early by having a special lunch in the parochial hall immediately after the morning service. The lunch was well supported and all enjoyed a delicious bowl of stew followed by apple pie and ice cream. Sincere thanks to the Ladies' Group for organising this. Update - Thanks to the generosity of parishioners a total of £500 was raised at this lunch. Another baptism took place at today's Morning Prayer service. The baby boy was baptized Freddie and is pictured here with his mum and dad, Natalie and Robert, together with our Rector, Rev. Canon David Humphries. 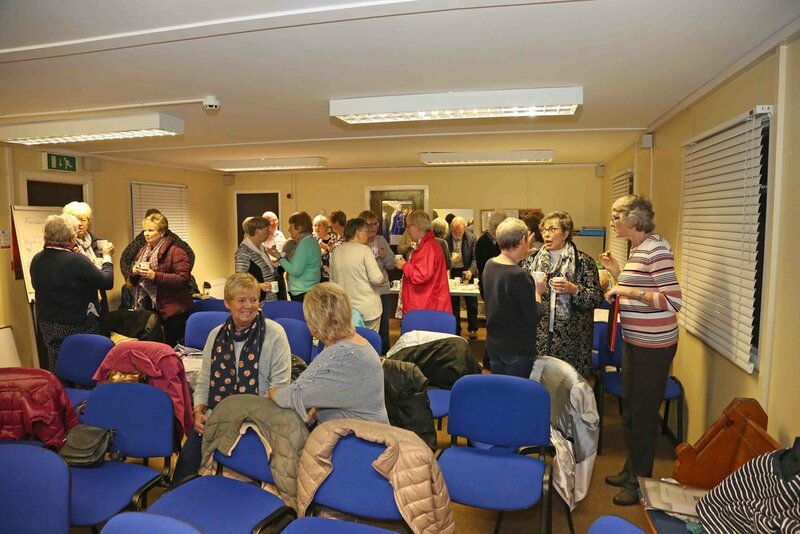 Twenty members met in the parish room for a talk on nutrition and healthy eating by Amanda Johnston. Amanda is a nutritional therapist and she gave a detailed explanation of the various food groups and their effects on the body. She gave out samples of a smoothie that she makes which is packed with fruit and vegetables as well as a ‘supergreen’ drink and answered questions on various issues the members had. Amanda can arrange tests for anyone concerned about allergies or intolerances to food groups. The evening finished with a very unhealthy supper of tea/coffee (caffeinated) with cakes and biscuits! 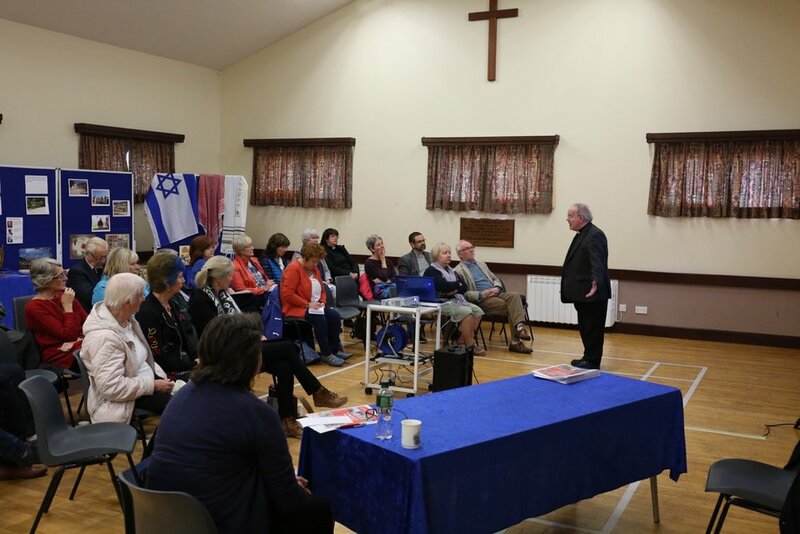 A number of ladies from St Bride’s attended and participated in this special interdenominational service held in Kilbride Presbyterian Church. The theme of the Women’s World Day of Prayer this year was “Am I being unfair to you?” and it was prepared by the Christian women of the Philippines. The speaker on Friday evening was Dani Quilario who is a nurse and who works in The Ulster Hospital in Dundonald. Her inspirational address was based on the hardships faced by her and her family as she grew up in the Philippines, before she eventually left to begin a new life, eventually settling in Northern Ireland. She was supported on the evening by her husband and a number of other Filipino nurses who are all living here and working with Dani in the Ulster Hospital. The ladies from St Bride’s were able to speak with her and her friends in the church hall after the service. A truly memorable evening for all who attended. Young people aged 13 or thereabouts are usually given the opportunity to prepare for Confirmation. 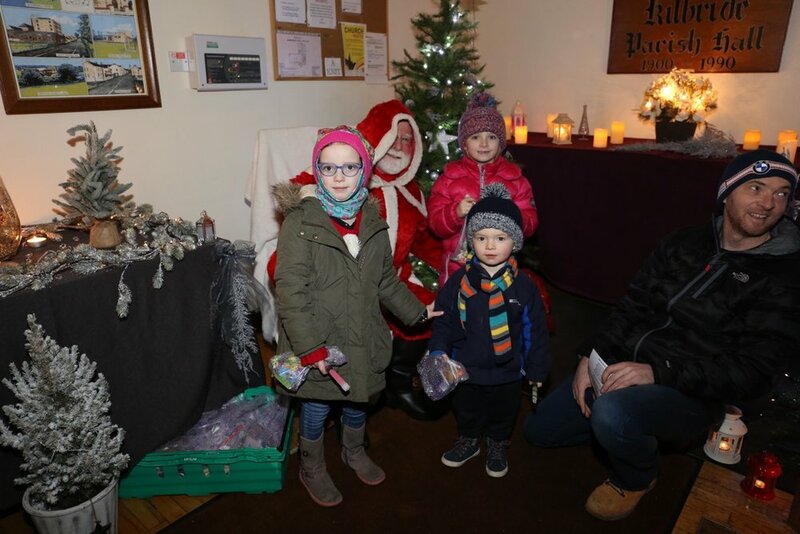 Parents of these children should contact the Rector right away, even if the children are in Sunday School, as the Rector may not know them yet. If some children are older and have somehow missed the opportunity to be confirmed, these people should also be drawn to the Rector’s attention. Any adults considering Confirmation should likewise speak to the Rector as soon as possible. Adults are prepared separately. Once we know how many candidates there will be, a date can be confirmed with the Bishop, most likely 19 November. 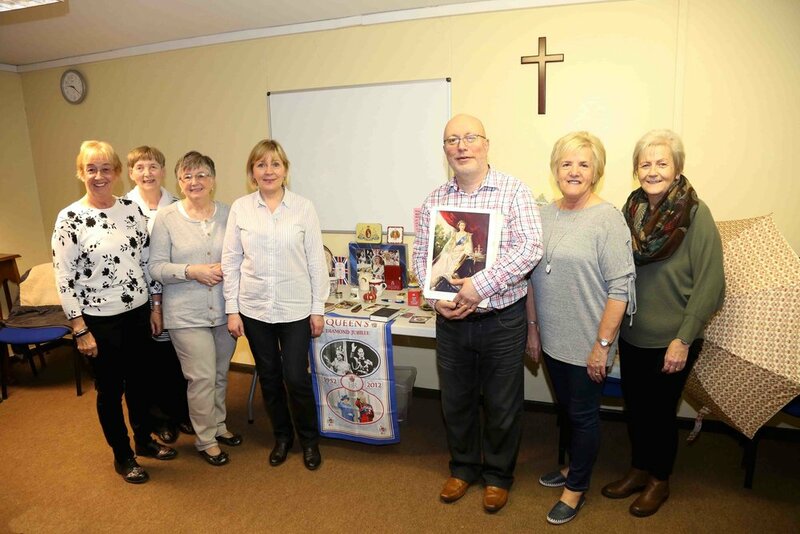 Christian Aid contacted Barbara Rea in recent days to thank her for organising singers and collectors from Kilbride Parish Church to join with singers from a number of other churches in the district at the annual Carol singing in the arrivals hall of Belfast International Airport. An impressive £764 was donated by generous travellers on their way home for Christmas, indeed some even joined in as they walked past! Following on quickly from the new Facebook page the new website for Kilbride Parish Church was launched today. It contains a lot of useful information relating to what is happening in the Church covering all aspects of Church life. It is still in development so there will be numerous modifications made over the coming months. Until it becomes more popular it may not be possible to find it in a standard 'Google' search but that should change as it is accessed more often. In the meantime pass the news on and use the full site address - www.kilbrideparishchurch.org in your browser. All feedback is welcome using the form on the 'Contact Us' page. 1st February is St Bride's Day so it's very appropriate that we started the Kilbride Parish Church Facebook page today. We hope you'll look there regularly and add to our discussions. Just look for it under Kilbride Parish Church or click on the Facebook icon at the bottom of any page of this website. A short service of Holy Communion was held today to celebrate St Bride's Day. Given that it was a week-day morning it was well attended and refreshments were enjoyed afterwards in the Vestry room. Our Rector performed his third baptism since arriving in Kilbride during today's morning service. The baby boy was baptized Jamie and is a little brother for Jake, both pictured here with their parents Lauren & Simon. Our Rector, Reverend David Humphries, was installed as a Chapter Canon of Belfast Cathedral at a service in St Anne's Cathedral. As a Canon he holds a senior position in the church. David was a Canon of St Anne's for the Diocese of Down and Dromore and after his move from St Molua's in Belfast to St Bride's he was appointed a Canon for the Connor Diocese. His official title is now Rev. Canon David Humphries! Our warmest congratulations go to parishioner Avril Nicholl, who has become a Member of the Order of the British Empire, or an MBE for short, in the Queen's New Year's Honours List. Avril received this award for her work with the Ballyclare branch of Riding for the Disabled over a period of thirty six years. This is a wonderful achievement and we celebrate with Avril and look forward to seeing a photograph of her at 'The Palace'.